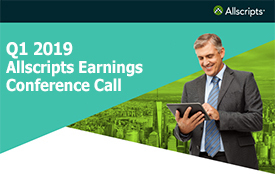 CHICAGO, March 25, 2019 (GLOBE NEWSWIRE) -- Allscripts (NASDAQ: MDRX) FollowMyHealth® today announced partnership with Ephraim McDowell Health on its enterprise and mobile patient engagement platform. FollowMyHealth offers a mobile, enterprise patient/consumer engagement platform for providers, hospitals and health systems who want to promote healthy patient populations and manage quality. It is a customizable platform that is helping organizations adapt to the evolving healthcare environment by redefining how healthcare professionals interact with and engage their patients. FollowMyHealth’s total connected patients hit over 17 million during 2018 with portal alone. With their expanded HealthGrid platform, that number is now 40 million and growing. Through implementing FollowMyHealth, clients are seeing up to 70% of patients actively engaged through the platform. By taking a platform approach versus the deployment of multiple disconnected smartphone “apps”, Ephraim McDowell Health is opting for a pro-consumer strategy, streamlining their patient experience to make it convenient for patients to stay engaged and informed with their health. “We as an industry must be prepared for the evolving healthcare IT landscape and start now on creating intuitive access to our services, a simplified method of enabling personalized outreaches, and improve how we coordinate a patient’s care journey. That is why we have decided to expand our partnership with FollowMyHealth and continue to enhance our patient engagement strategy and capabilities,” said Gary Neat, CIO of Ephraim McDowell Health.